Rex is a company of designers intent on delivering business solutions in the form of intelligent and inspirational design. The company carries the conviction that design is built on three fundamentals: purpose, truth, and attraction. REX operates internationally from offices in Johannesburg, working with clients ranging from Coca-Cola World Wide in Atlanta, to the WITS Pediatric HIV Clinic in Soweto. Founding partners Rudo Botha and Olivier Schildt established the company in July 2004. Over the past year, REX has developed imaging for television, brand internalisation tactics, brand strategies for FMCC products, designed packaging solutions and shaped identities for clients ranging from the boutique to established corporations. Business performance has been growing steadily during the first three years and with a view of what has been established, it looks set to expand profitably. In 2007 cost of sales has been curbed even further, making up only 4% of total turnover. The results from the work and the feedback from clients in 2007 have been amazing. The paradigm shifts that have been effected, the new territories the brands ventured into and the resonance with consumers indicate that creativity still can achieve what so few other properties can. 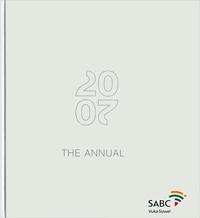 No creative awards were entered in 2007. REX offers young, fresh perspective and has a unique, multidisciplinary offering. The company has clear intent and an impressive track record. “Rex really helped bring our business vision to fruition. Yes, the team has very strong design skills, but they also bring an intellectual approach to the process, which helped us express an extraordinary brand story and promise that defines our company, “ say clients Lorraine Smith & Melina McDonald. REX believes that there is no such thing as design for design’s sake. Design is built on three fundamentals: purpose, truth, and attraction. At the company’s core lies the simple yet earnest believe that design works – more than that – design can be the most valuable business tool with which to achieve greater efficiency, greater differentiation and greater attraction. So says Olivier Schildt, Creative Director and Rex Founding Partner with Rudo Botha, who is MD. When they formed an association in 2004, Botha and Schildt first spent most of their time intensively developing what they believe is their unique approach to clients: figuring out the best ways to get to the core of the organisation and then using that essential quality to design and deliver a valuable product that will measurably add business value. The Rex men say that being young and open to new ideas opened opportunities for them because of the state of the industry: “It’s colliding in on itself with all new forms of communicating and the fact that people can choose how to communicate and with whom and when. We found ourselves getting roped in on projects where agencies weren’t following traditional projects and we somehow got featured in their budgets. Now about half our work is for other agencies and half directly for clients,” says Botha. When Rex takes a brief, they try to get understanding way beyond what generally is the set task, then go away and figure out what the customer really needs, and a way to deliver on it. “Once we are able to identify and work out a way to solve that wider need, it’s imperative that everybody in the company from the top down buys into the solution,” says Botha. He says many marketers are ‘not really listening’ to their clients and their customers. “More and more, we find ourselves telling clients that this or that is what their customers really want – something they had not thought of or were totally unaware of. It makes a huge difference to the way you approach the creative solutions.” says Botha. The pair says they have noticed that women clients seem more responsive to their approach than are men. “Maybe it’s because they more easily relate to a story than do men,” says Botha. One of the agency’s most memorable projects was for Coca-Cola, which turns 125 in 2008. The project, dubbed Coca-Cola Remix, saw 125 artists from around the world taking 125 years of Coca-Cola marketing material and re-inventing it to create a series of fresh visuals inspired by the brand’s new global positioning statement – the Coke side of life. Each ‘artist’ – who includes icons such as Sir Peter Blake, who designed the cover of the Beatles’ Sgt Pepper’s Lonely Hearts Club Band album, as well as creative collaboratives such as Rex – was given unlimited access to Coca-Cola’s archived marketing material, and invited to re-interpret these visuals in their unique style to bring the Coke mantra of ‘happiness in a bottle’ to life. The result is a gallery of imagery that pays homage to the brand’s heritage and the prominent role that it has played in popular global culture over the years, while simultaneously building its present branding platform. The work exists in a variety of media formats, both static and animated, and has been brought to life via traditional print and outdoor executions across the world, as well as a series of outdoor art galleries (such as on London’s South Bank) and via an online ‘vault’, which allows the work to live globally. The work will also be displayed in the Coca-Cola Museum in Atlanta, and an initiative to invite consumers to render their own Coca-Cola Remix visions has begun. “It is a great honour to be involved in a project of this nature, not only because of the stature of the brand but also because of the enormous strides that it represents for marketing as a discipline,” comments Botha. Rex’s Remix of the Coca-Cola brand, which the creators have dubbed ‘Cola-Cola Origami’ tells an African story using the universal language created by Coke over the years. Each piece of the design folds in on itself to reveal a new image, a bird that’s swallowed by a crocodile which transforms into a herd of migrating buffalo. “It’s a completely new story made out of old stories. It’s a piece of Africa, made out of pieces of the global Coke world,” says Botha. Rex was invited to work on the Coca-Cola Remix project as a result of their past involvement with the Coca-Cola brand. In 2005, Rex was one of the so-called Magnificent 5 (or M5) – five agencies chosen from around the world who were tasked with re-integrating the Coca-Cola brand back into the lives and lifestyles of today’s youth. It was out of the M5 project that the seeds for the ‘Coke Side of Life’ campaign – which is now recognised as one of the brand’s most successful marketing campaigns – were sown.